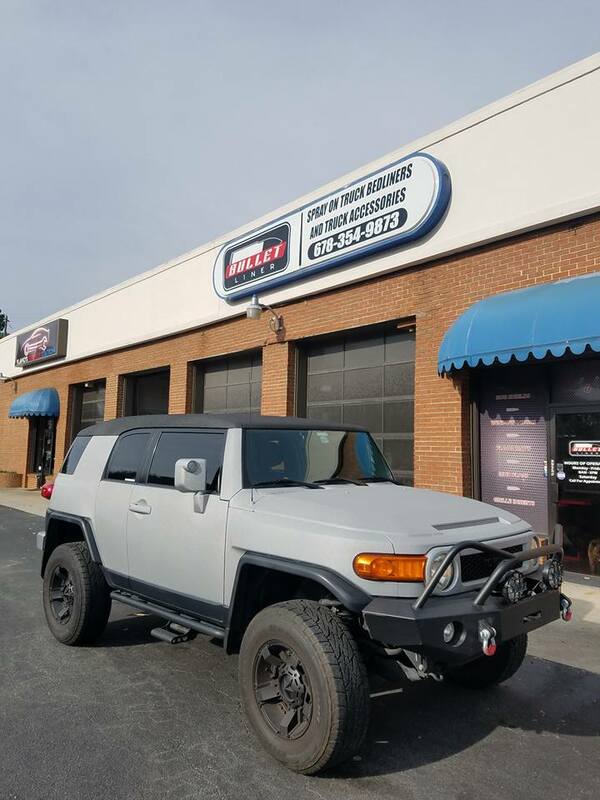 This month’s Dealer Spotlight is on owner-operator Shane McPherson and the team at Bullet Liner of Marietta, GA. Shane opened Bullet Liner’s first ever flagship dealership, back in 2010. He has since enjoyed hallmark success and gone on to become one of the brand’s marquee operators. “Bleeding Bullet Liner black and red” from the moment he first opened his doors up until today, Shane reigns as one of the highest grossing Bullet Liner dealer-member shops in the U.S.
Shane’s foray into the brand extends back to Bullet Liner’s Burtin Polymer Labs’ roots and heritage. As one of the early pioneers in truck bedliner technology and development, Burtin kickstarted the industry nearly 30 years ago with the introduction of its signature elastomer technology and premier spray offering. When the Burtin brand transitioned to the Bullet Liner namesake several years ago, company leadership continued to grow and build upon an iconic heritage. And in 2015, when Bullet Liner was purchased by North American polymer and polyurethane technology leader, Accella Performance Materials, the brand’s foundation was strengthened further by an infusion of world class science, R&D and innovation – led by some of the best polyurea chemists on the market. Today, Bullet Liner is known for its technology integrity, unparalleled product performance and a customer service ethos that has given the brand a reputation among bedliner enthusiasts that’s unparalleled. The fact that Bullet Liner is one of the only “Un” Franchised dealer network models in the red hot spray-on truck bed liner space has made it all the more attractive to dealers like Shane who are drawn to the benefits of independent ownership. What is it about the Bullet Liner brand that’s been the secret to your success for nearly a decade? Shane McPherson: I think it has to be the background of the company. Bullet Liner just has a very strong company and strong team. These factors – coupled with the attractive price point of the Bullet Liner chemicals and the quality of the product itself – make it a “go to” brand in the market versus anything else out there. Bullet Liner is just a really cool brand to sell. And when you sell a cool brand with good technology, there’s a trickle-down effect. Someone who has a good experience with it is anxious to tell-a-friend. That’s how our business has snowballed. What sets the Bullet Liner product apart from the competition? Shane McPherson: From a technical perspective, for our customers, it’s all about how the product looks and feels. These two qualities are always the first two things that they mention. The signature of the Bullet Liner product is its texture. The texture just stands out and is the one element that strikes me daily as being at the heart of what’s special about the line. Bullet Liner spray is also extremely rich in color – really vibrant. And, it’s highly resilient. A very tough all-around product. Can you talk a little bit about your success? Shane McPherson: It’s all comes down to the numbers. If you look at our numbers, by the month, our growth is very sustained. When we first started, back in 2010, we were doing 50 bedliners per month. Nearly, every year, for five years straight, we grew by 20 percent annually. And, now we’re just rockin’. We’re doing 80-85 bedliners per month, and have expanded into a wide range of additional projects. We’re spraying everything – every part of the vehicle – and we’ve done 14 full exteriors. And I can easily handle the workload with just two employees – Patrick and Chris – who are great assets to our operation. What do you like about Bullet Liner’s dealer model as opposed to joining a typical franchise network? Shane McPherson: Bullet Liner operates as a non-franchised network. They offer us independent ownership with all of the benefits of full corporate support (lead generation, the opportunity to take advantage of a free personalized retail website, a warranty for the lifetime of the product, and so on), but without being pinned down. That’s the beauty of the whole situation. There’s no Big Brother looking over you saying you can’t do this or can’t sell a certain way. And, the fact that we have no franchise fees is huge. It allows us to present a fairer price to our customers – and, ultimately, to service them better. On behalf of all of us at Bullet Liner, a big thanks to Shane for all your great work and for being a shining example of Bullet Liner in action. Please visit his team and check out his spray shop on Facebook.